As a general rule, I HATE chain restaurants. Unless my life depends on it or my grandmother requests to go to one, I'd rather go just about anywhere else. Except Roly Poly. I'm embarrassed to say how many times I've eaten at Roly Poly in the last week, but let's just say I could be their version of Jerod from Subway. I have been singing the praises of Roly Poly since it first opened near my place of employment a few years ago. It's kind of a vegetarian fantasy-land, with multiple salad and wrap options and "Pinkberry-like" tart yogurt. Roly Poly also offers a "roll your own" option where you can play chef and select more vegetables than I've ever seen offered in a sandwich shop and create a tasty - yet relatively low calorie - wrap on a wheat or white tortilla. 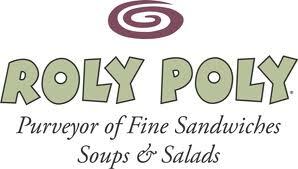 I think Roly Poly is categorized as a "fast casual" restaurant, a term I learned from the new show on NBC - America's Next Great Restaurant - chronicling the story line of a few wacky people pitching various ideas to open their own mini chain of quick serve restaurants across the US. Some examples of fast casual are Chipotle, Panera...and just about any other place where you can order, sit at a table, and there isn't a drive through falls into this category. I have to say that I'm a fan of this concept because sometimes a sit down restaurant is too slow...and there's pretty much nothing I can eat at a fast food restaurant. Do you have a favorite vegetarian friendly fast casual restaurant?